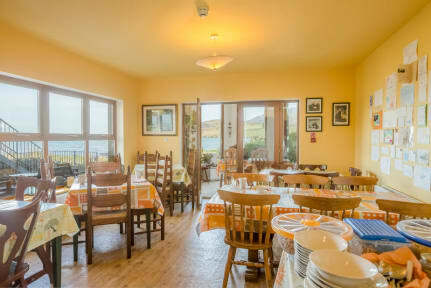 Mount Brandon Hostel is a family run, child friendly and orientated hostel, especially during the summer. While staying with us you can enjoy the surf and the beaches surrounding the bay, some of the best available in Ireland and enjoyed yearly by many from far and near. Large dining room overlooking the Bay. Cosy lounge overlooking the Sea. Well-equipped, self-catering kitchen. Light breakfast provided at no extra cost - Tea/Coffee, Cereal, Toast. Full laundry facilities. Pick-ups/Drop-Offs arranged. Baggage transfer arranged. We have a patio and picnic area with stunning sea views. At Mount Brandon Hostel, we offer lovely Single, Double, Twin, Family and Dorm rooms - all with private Bathrooms. Free Wi-Fi and Internet access point. Towels provided on request. Bed Linen provided and beds made up for guests. Apartments for mini breaks and longer stays - also for Group Leaders. Private, secure car park. There is music, song and dance nights in hostel all year round, plus there is meditation / yoga space.. 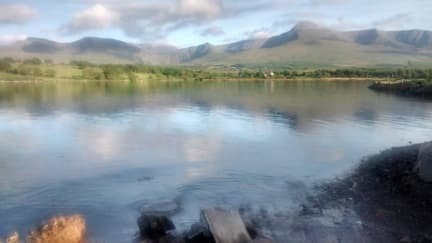 Located in the lovely village of Cloghane on the Dingle Peninsula, there are 2 great village pubs with music sessions, open fires, great food within 1 minutes walk. Award winning shop in Village - Local Cheeses, Pates, Free Range eggs etc. Pet friendly- Please check in with us in advance, if you plan to bring a pet. We are very heavily booked at times, especially at weekends in July and August. Unless you are part of a group with exclusive use of the hostel, we ask that you respect our quiet time policies between 23:00 and 7:00.